About: Management Aptitude Test (MAT 2019) is a standard aptitude test conducted in India since 1998 by the All India Management Association(AIMA). MAT is an admission gateway to around more than 600 Business schools of the country. Business schools can consider the MAT 2019 score of the candidates for admissions to Master of Business Administration [MBA] and allied programmes. Approved by MHRD: One of the premiere Entrance Examinations for Post Graduation approved by the Govt. of India, Ministry of Human Resource Development (HRD) as a national level test in the year 2003. Skills tested: The MAT 2019 will test a candidate's language comprehension, Mathematical skills, Data Analysis and Sufficiency, Intelligence and Critical Reasoning, Knowledge of the Indian and global environment. Courses offered: The MAT 2019 score is considered by more than 600 Business Schools throughout the country and a few International Business schools as well for admission to MBA, PGDM, and other allied programmes. Mode of Examination: The candidates have a choice to take either an offline (paper-based) or an online (computer-based) MAT 2019. The examination will be conducted either in Hindi or English. Duration of Examination: The MAT 2019 will be conducted for a duration of two and a half hours (2.5 hours) in which the applicants are supposed to answer 200 objective questions. 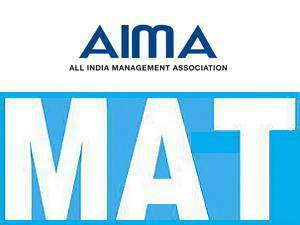 Examination held: The AIMA conducts MAT four times in a year in the months of February, May, September, and December. Center of Examination: The test will be conducted at various centres across the country in the four months mentioned above. Application availability: The application form for MAT 2019 will be available on the official website of the AIMA from 1st March 2019 until 26th April 2019. Candidates can Check the Application Process and how to fill the Application form. MAT Score validity: The result of MAT 2019 will be declared within a few weeks after the conduction of the test. The test score will be valid for a year. Last Date to Register: Registration for MAT 2019 Exam (computer-based test) will close on 26th April 2019. Official Website: Candidates can download the Admit card for MAT 2019 online on the official website of AIMA. Important Note: AIMA has come across a couple of cases where the aspiring candidates' MAT 2019 Score is not accepted by some participating Institutes/ Universities for admission to MBA full-time courses despite their confirmation to AIMS at the time of participation by incorporating their notifications in MAT Bulleting. There is no age limitation for MAT 2019 Exam. Candidates can apply for any number of times. Candidates who are in final year of there graduation program can also apply for MAT 2019 Exam on a conditional basis. Admission will be granted on a conditional basis i.e. candidates will be required to clear the final year exam before starting post-graduation in the B-Schools. To know more about MAT 2019 eligibility criteria Click Here. Exam Level: The syllabus for MAT 2019 contains aptitude questions of graduation level. Sections of Paper: The test will be divided into the following sections: Data Analysis & Sufficiency, Language Comprehension, Intelligence & Critical Reasoning, Mathematical Skills. General Awareness: MAT 2019 exam syllabus contains the section of Indian & Global Environment. Candidate needs to prepare the General Knowledge and awareness section also. To know more about Syllabus and to download MAT 2019 syllabus pdf Click Here. To know more about the MAT 2019 Exam Pattern Click Here. Irrespective of the candidate's category, the candidate need to pay a total of 1550/- INR as an application fee. Candidate can make payment of MAT 2019 exam through Credit card/Debit card/Net banking only..
To know more about the MAT 2019 Application form Click Here. Exam Centres: MAT 2019 exam centres will be available in the major cities of India. For MAT 2019 online and offline exam, test centres will be different. Reporting Time: Candidate can report to the MAT 2019 exam centres 30 minutes before the exam time. Exam centres will be open 60 minutes before the exam time for the candidates. Exam Centre Selection: Candidate will have an option to select two cities as an exam centre either in an online or offline mode of MAT 2019 exam. To know more about the MAT 2019 Exam Centre Click Here. Admit Card Availability: Candidates can download their MAT 2019 admit card for Paper-Based/Computer-Based examination from the AIMA's official website. Admit Card Issuance: Separate Admit Cards will be issued for online and offline exams. However, The AIMA will not send a hard copy of the admit card to any of the candidates, it is only available online. Admit Card Release Date: Admit Card of MAT 2019 exam available to download from 19th May 2019 for computer-based test and for pen and paper-based test, the admit card will be available to download from 17 February 2019. To know more about the MAT 2019 Admit card Click Here. Official Website: Candidates can view their MAT 2019 Result on the official website of AIMA. Result Availability: MAT 2019 Result will be available to download from 10th June 2019. Scorecard: Candidates are advised to take a printout of the MAT 2019 scorecard for reference and future use. Click Here to know more about MAT 2019 Results. Selection Procedure: Selection procedure for MAT 2019 consists of Group Discussion, Personal Interview and or Written Ability Test (WAT). Counselling Date: MAT 2019 Counselling Process will start from 1st January 1970. Document Required: For the MAT 2019 counselling purpose candidate need to carry the document such as Admit Card, Graduation Degree Original Certificate, Photographs etc. To know more about the MAT 2019 Counselling Process Click Here. Focused Area: Candidate need to focus on the Aptitude, General Knowledge, General Awareness. The candidate is advised not to skip any topics related to the aptitude section. Previous Year Question Paper: Candidate need to go through the previous year question papers and follow the exam pattern for preparation for MAT 2019 Exam. Mock Test: Candidates need to give mock test time to time and analyze the week and strong points. Candidates should go through the Mock Test Papers for their easy preparation. Accuracy: Candidate needs to increase the accuracy while practising for the MAT 2019 exam. Accuracy will help the candidate to score more marks and avoid negative marking. Hall Ticket: The candidate must show, on demand, the Hall Ticket for admission in the examination room/hall. A candidate who does not possess the MAT 2019 Hall Ticket will not be permitted for the examination under any circumstances. Maintain Silence: Candidates should maintain silence throughout the exam. Carrying Expensive accessories: Carrying Calculators, Docu Pen, Log Tables, Electronic Watches with facilities of Calculator, Printed or written material, Mobile Phones, Pager or any other Electronic Gadgets, except the Admit Card. Communication: Any form of communication with other candidates. Roll number with seat allotment: The candidates are not allowed to enter the MAT 2019 Exam Centre after the commencement of the examination. A seat indicating roll number will be allocated to each candidate. Candidate should find out and occupy their allotted seat only. Any candidate found to have changed room or the seat on his/her own other than allotted, his/her candidature shall be cancelled and no plea would be accepted for it. Allotted seat: A seat indicating Hall Ticket number will be allocated to each candidate. Candidate should find out and occupy their allotted seat only. Misusing the Test booklet: Removing any page(s) from the Test Booklet (in case of Paper Based Test Examination). The candidates will be debarred from the examination permanently or for a specified time, depending on the nature of the offence. Commencement of application process: The MAT 2019 application process begins on 1st March 2019. Last date for submission of offline application form: The last date to submit MAT 2019 offline application form 26th April 2019. Last date for submission of online application form: The last date to submit MAT 2019 online application form 23rd August 2019. Admit card availability: The MAT 2019 admit card for Paper-Based will be made available on or after 19th May 2019. MAT exam date: The MAT 2019 paper based test will be held on 23rd May 2019 and the computer-based test will be held on 24th May 2019. Result date: The MAT 2019 results will usually be released within a month of the exam. It is being released this session on 10th June 2019. Counselling date: MAT 2019 counselling process starts on 1st January 1970. Graduate: Candidates applying for MAT 2019 should shave completed their graduation in any stream from a recognized university. Percentage: Candidates should have passed their Undergraduate with a minimum of 50%. SC/ST: The SC/ST candidates who apply for MAT 2019 should have secured a minimum of 45% in their graduation. Final Year: Final year students are also eligible to apply for MAT 2019. Age Limit: There is no age limit to apply for MAT 2019 exam. Attempts: There is no limit on the number of attempts a candidate can take for MAT. Applicants appearing for the MAT 2019 need to open the Official Website of AIMA. Click on the link to fill the online Application Form to MAT 2019 on the website. Fill in all the required details and attach the required documents for MAT. Submit the MAT 2019 Application Form. Application date: Candidates can fill the application form from 1st March 2019 to 26th April 2019. Fee: The MAT 2019 application fees is INR 1,550/-. The fee is same for candidates of all categories. Fee Payment: The MAT 2019 application fees can be paid by Debit Card, Credit Card or Net Banking. Acknowledgement Slip: Candidates will get an acknowledgement slip on successful submission and verification of MAT 2019 application form. Note: Candidates are advised to check the details on the Official Website before submitting the form. Click on the MAT 2019 exam admit card link. Download the MAT 2019 Admit Card and take a printout. The admit card will contain details like name of the candidate, MAT 2019 application number, date of MAT 2019 exam etc. The MAT 2019 admit card will not be sent by post. Hence, students must download the admit card. Preserve the MAT 2019 Admit card till the admission process. The details on MAT 2019 admit card must be verified and discrepancies if any must be reported to the concerned authority. The MAT 2019 exam will be held for 2 hours and 30 minutes. The MAT 2019 exam will consist of 200 multiple choice questions. The sections are Language Comprehension, Mathematical Skills, Data Analysis, Reasoning and Indian and Global Environment. The candidate will be awarded 1 mark for every correct answer and 1/4 mark will be deducted for every incorrect answer. Language Comprehension Syllabus: Idioms, Sentence Completion, Antonyms etc. Mathematical Skills Syllabus: Percentages, Ratio, and Proportion, Geometric Progression etc. Data Analysis and Sufficiency Syllabus: Series, Table Charts, Bar Graphs etc. Intelligence and Critical Reasoning Syllabus: Coding and Decoding, Matrix Arrangement, Linear arrangements etc. Indian and Global Environment: Current Affairs, Geography, History etc. MAT 2019 result will declare on 10th June 2019. The candidates must visit the official website of MAT. They must log-in using the register number, form number and month of the test. The MAT 2019 scorecard will not be sent by post. Students must download the MAT score card online. The MAT 2019 scores are valid for a duration of 1 year. MAT 2019 counselling process starts from 1st January 1970. Management Institutes participating in MAT 2019 Examination are categorized, geographically, into East Zone, West Zone, North Zone & West Zone. The candidates would have to confirm their MAT 2019 rank first. They should also confirm the MAT 2019 counselling dates. Candidates should also select some colleges in which they wish to get admission. Caste certificates for reserved category. Recent 6 passport size black & white and colour photographs. You have to qualify the cutoff for MAT Exam 2019 to advance to the next stages of the Exam. The MAT Cutoff will depend upon the factors such as level of difficulty of the exam, the no. of participants in MAT Exam. The cutoffs will be decided by the participating colleges under MAT. Eligibility criteria was according to the entrance test merit. I took MAT and scored around 94.88 % Cut off was more than 85%. The eligibility criteria to start studying MBA in Sindhi is the candidate should have completed a bachelor's degree in any field irrespective of the degree is in the field of commerce, science or medicine or arts as well. MAT (Management aptitude test) scores will be considered by the college. The eligibility criteria of the college are, has to be passed any degree of their choice. The admission process is through, PGCET or MAT. There are 2 types of names in the choice of colleges at the time of counseling i.e, shift I which has a cutoff of below the rank of 5,000 and the shift II has a cutoff rank of below/up to 10,000-15,000. The d.y. patil Business school providing the courses like mba and pgdm. The eligible criteria for admission is 60%. You to give entrance exams like cat, mat etc. You can direct apply after the cutoff list. The selection process includes the telephonic interview and aptitude test. Procedure for admission is telephonic interview then aptitude then they will send a call letter. You have to pay an amount of 35k to reserve your seat. Then verification of the document is done. I had given MAT entrance exam. There was no procedure of cutoffs for our course. THE ELIGIBILITY CRITERIA IS ANY DEGREE COURSE COMPLETION AT AROUND 70%. I ATTENDED MAT ENTRANCE EXAMINATION. THE SCORE WAS NOT TOO GOOD, IT WAS OK. The admission criteria are pretty simple with 2 rounds of Personal Interviews either in-person (if you are from Bangalore) or via Skype (if your native is anywhere out of Bangalore). The faculties take the interviews. The selection of the faculties for the interview process is on a random basis. The results are generally given out within a week from the date of the interview. Entrance exams such as CAT, MAT, XAT, etc. are mandatory and (at least anyone) should be completed before joining the institution. 50% pass percentage was the Cut-Off for MBA under general merit and 45% for others. You can take either the CAT/MAT exam. What mode of exam should i select? Online or Offline? Which colleges accept MAT 2018 Scores? Can i know which college should apply for MBA after MAT exam? There are more than 100 colleges which accepts MAT scores, you can select and know more about them from the link here. Can you tell me the cutoff percentile of AIMIT Bangalore? AIMIT Bangalore percentile will lie between 55-60 only. The average placement of this college is 5.50 lack. I got 75 percentile in MAT exam so can you tell me the which college will I get alloted? How many MIs participate in MAT? Do they keep on changing or remain the same? How many MI's participate in MAT? Do they keep on changing or remain the same for each exam session? The number of participating MI’s participating in MAT may vary each year and from test to test. The Admission Criteria for each institute will be different. All MI's taking part in MAT are either AICTE Approved/DEC Approved/University Affiliated Colleges/University Department. How can I get my MAT scores by SMS? This facility will be provided by all the Network Operators.